I’m very sorry to report that last night Beth Jacob was a target of a cowardly act by an individual who spray-painted an anti-Semitic message on the front wall of our synagogue facing Michelson Drive. The hateful graffiti was discovered by our staff this morning, at which point Irvine Police Department was notified and a full investigation is underway. Here is what we know so far based on our camera footage. At about 1:18 AM, an individual wearing a hoodie, sunglasses and a surgical facemask jumped our fence at the pedestrian entrance on Michelson Drive. 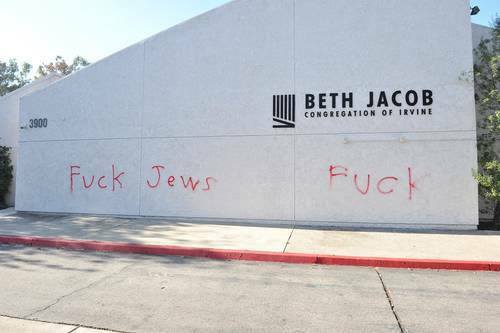 The suspect proceeded towards the wall where the Beth Jacob of Irvine sign is facing the street and began to spray-paint his hateful message. After he was done, the suspect left the premises on a bicycle he apparently stolen from our premises. The Irvine Police Department and our own security have done a full sweep of the entire facility and nothing was found other than the graffiti. We are continuing to do everything we can to make our campus more secure, and we will continue to promote the message that we are stronger than hate.